Why you should go for a walk. Not just to take in the beautiful English countryside, but for your health as well. Anyone who&apos;s been for a good long walk will always come back reinvigorated, although often with achy legs, but that&apos;s all part of the fun. So if you haven&apos;t been for a stroll after dinner, a walk with the dog or enjoyed a lengthy trek, then you have been missing out. 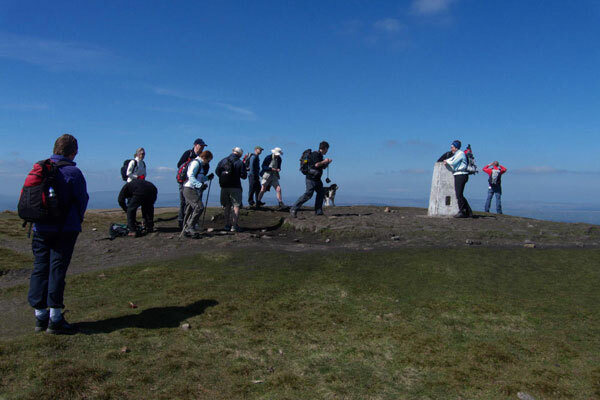 Pendle and the surrounding districts is the perfect place for a walking holiday where you can take in the stunning scenery, historic places and rustic villages, but most importantly get some exercise. As a nation influenced by America into fixating on the gym and Starbucks coffee, it&apos;s easy to forget how we are surrounded by beautiful rolling countryside, history, nature and culture. The human body is better suited to walking than any other activity because of the structure, shape and flexibility of the spine. Simply by walking from one place to another, the body functions perfectly in everyway because it is what we are designed to do. This is a rather obvious explanation why walking is good for your health, not just as a form of regular exercise, but can prevent stiffness of the joints and relieve back pain by promoting a proper standing posture. One of the best places to go for a relaxing and reinvigorating stroll is Pendle, where you will not only exercise the body, but also calm the mind - a combination which has been known to reduce blood pressure and promote a feeling a well being. When walking through the countryside a suitable pair of outdoor shoes is essential. Appropriate walking shoes should be lightweight, hard wearing, well cushioned and highly breathable to prevent hot and sweaty feet, let along the rubbing of blisters. Now that the health and safety is out of the way, we can focus on the health benefits of walking such as how a brisk walk does wonders for the heart and lungs. This form of aerobic exercise expands your lung capacity and increases the efficiency of your walking muscles while improving blood circulation so that muscles and blood can process more oxygen. While walking won&apos;t cut cholesterol, because they depends on you eating less far, it does help the body to produce good cholesterol (known as HDLs) which protect the arteries compared to bad cholesterol (LDL) which clogs the arteries. So the more you walk, the more good cholesterol the body will produce. Walking regularly will also help to prevent back pain and stiff joints in later life. This is because walking massages the mechanics of the body, improving muscle tone and strength by putting weight on the bones and increasing their density in order to bear that weight. As bones gain mass, they grow sturdier and will be less prone to breaks. Back pain in particular is often caused by an inactive lifestyle and poor posture. Especially in people slouched in front of a computer for long hours of the day. Walking for fitness works the large muscle groups, strengthening the postural muscles of the legs, buttocks, back and abdomen, maintaining the ideal upright posture. In fact, walking regularly is one of the best things you can do for your back. So now that you&apos;ve taken the lecture and got yourself a pair of suitable walking shoes, walking holidays can provide the perfect way to get walking so that you can take in the countryside, get some fresh air and essential exercise. The Pendle area is rich in history and the transition over time from agriculture to textiles and right up to the modern day can been seen across the land as well as in and around the various villages and buildings scattered across the countryside. There are a wide range of walks around Pendle to enjoy from leisurely strolls 2 mile strolls to day long treks stretching over 6 miles. For particularly long walks hiking shoes are recommended as they provide additional ankle support and underfoot cushioning which will make life easier on the feet and offer protection against sharp stones and other objects on a trail. If you are unsure where to go, there are many group walks organised on a daily basis throughout the warmer times of the year. In this instance a local guide will take walking parties on an adventure trail where they will experience the sights, sounds and scents of the countryside and rural villages, passing many points of natural beauty and historical significance along the way. So if you feel the need to relaxation and reinvigoration for both body and mind, then a weekend or even a whole week walking in Pendle can do you the world of good. With thousands of places walks to enjoy, places to experience and a history to explore, walks in Pendle have something for everyone.